This web resource is a result of hillclimbing and sprinting an Ensign LNF3 and therefore taking a personal interest in these F3 racing cars which appeared from 1970 to 1974. 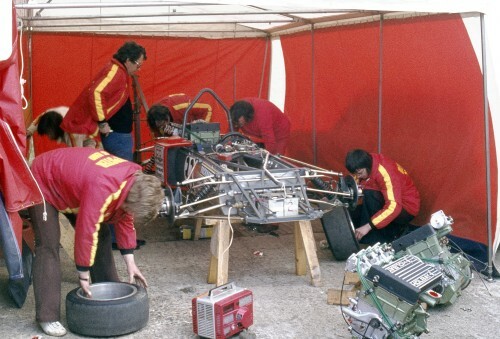 Apart from the first Ensign chassis which was tested late in 1970, their F3 cars were mainly built in 1971 and 1972 although 'new' cars did appear later, perhaps existing chassis when the business was 'sold on' at the end of 1973. I'm no motor sport historian so please compromise with me if you think that some information is incorrect, and contact me. It's irritating when inaccurate information appears on the web, immediately to be accepted as the whole truth. Where known, sources of borrowed images are credited and let me know if you have not been credited, or want anything to be removed. It was Mo Nunn's project and after a successful driving career he designed and built the early LNF3 cars in the garage attached to his Walsall home. After the F3 cars he built a series of F1 cars, subsequently moving to the USA and engineering successful single seater race cars before retiring in 2014. 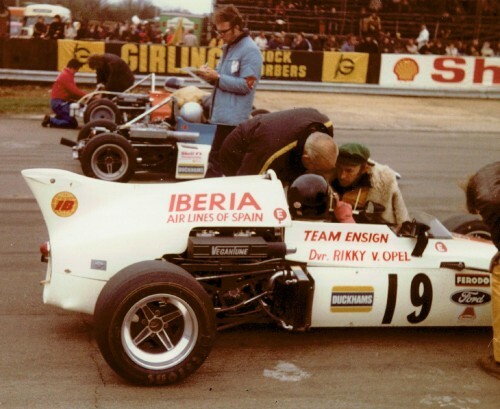 Mo Nunn's ex-brother in law Derek Lees has been helpful providing detail information - he worked for Ensign, a mechanic for the works 'Iberia' sponsored Ensign of Rikki von Opel, later working on their F1 cars. Happily Simon Arless recently introduced himself at a sprint, Simon working on the production of the F3 cars for several years. Mails from John Cavill and Keith Lay have added specific information together with one from Trevor Hilliar whose father Tom came to Europe from the US with his wife and young Trevor, bought an Ensign and went racing, as one did! This was interestingly confirmed in a recent chat with Spencer Elton who knew Hillier, another Ensign owner who has been around the UK racing scene for ever and, of course, the son of Tom Elton. Contact with past and present Ensign owners and drivers remains fascinating, informative and will add to this resource so please talk to me! Sadly it has been reported that, following a long period of ill health, Mo Nunn died on the 17th July 2018 (born 27th September 1938). All written material is the copyright of ensignf3.com and may be used providing the source is acknowledged and a link provided to this site. Apart from period printed information there are excellent web resources – F2 Register, Classic F3. 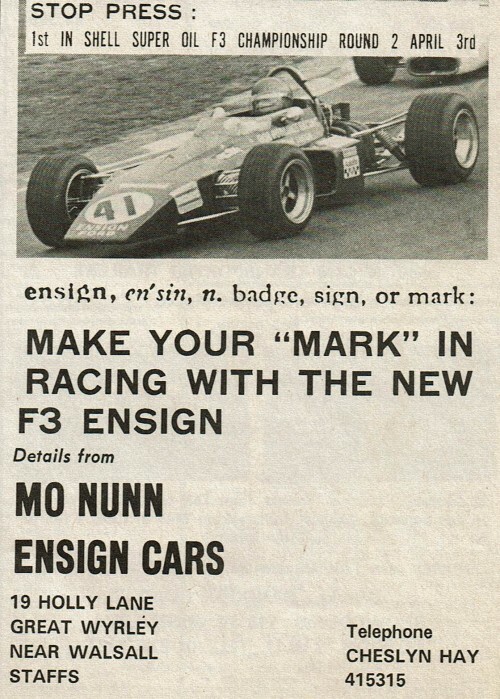 If you own an Ensign F3, were associated with them in the past or have interesting information about the cars, I'd be delighted to hear from you. There's a diary about the modest use of my own Ensign LNF3 here. The name of Ensign is synonymous with Mo Nunn as it was his project. Born 27.9.1938 and from Walsall in the West Midlands, he was a regular competitor into the ‘screamer’ era and it was probably logical, feeling confident in his engineering skills, to develop his own car following his 30th birthday, despite a works seat in the 1969 Lotus F3 alongside Roy Pike. He had enjoyed financial support from Bernard Lewis, the local business man being acknowledged with the model suffix applied to Ensigns – LNF3 – Lewis Nunn F3. Starting on this project Mo still lived in Walsall, a visitor to his home remarking - ‘I arrived at his house and his wife told me to go round to the garage at the side of the house. I was amazed. This was the first time that I had seen a domestic garage with a painted floor, cladded walls, and surgical lighting above the main work area’. The first Ensign was built in this professional yet modest environment, 19 Holly Lane, Great Wyrley, Walsall. Not that different from a current builder of quick hill climb cars in Lichfield - Ian Dayson and Force Racing Cars. Later a workshop was rented in Brineton Street, Walsall and later still premises at Chasetown in Stafforshire. It’s interesting to speculate from where the design inspiration stemmed. Immediately obvious are the side radiators, then new in F3, concentrating weight to the center of the chassis and enabling a low, wedge nose, the Lotus 72 providing design inspiration. Within F3 most chassis measurements will have followed an established pattern and I imagine everyone measured the Brabham BT21 as Ron Tauranac knew what he was doing. One might also speculate that Dave Baldwin had some input as he was involved with the design of the 72 and worked for Lotus Components and was presumably in the loop of the latest Lotus developments. He later supported Ensign 'officially' from 1973 and was closely involved with the Ensign F1 design and build programme. Like most F3 cars components came from established sources, magnesium front uprights and modified Triumph Herald steering from the Lotus 59 although magnesium rear uprights and wheels were cast specially by Aeroplane & Motor Castings, Tyburn Road, Birmingham. An Astrali steering wheel, this Walsall accessory company still existing today, also provided Nunn with sponsorship in the day. 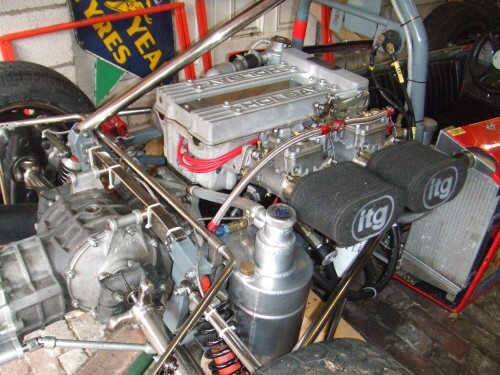 Naturally the gearbox was the 1" layshaft Hewland Mk8, brakes by Girling, power by modified Ford Lotus twincams initially from Vegantune and later Holbay although no Ensign ran with a Novamotor. Mostly fuel injection, some Vegantune with 3 main bearings. 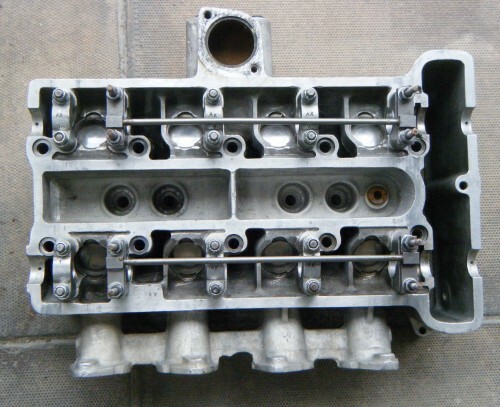 The source of much bile was the compulsory inlet restriction, initially 20.5mm diameter and subsequently 21.5mm then 22.5mm, engines unwilling to rev above 6000rpm and around 115-125bhp available, little different to the old 1000cc 'screamer' F3s although there was the optimistic aim of greater reliability and reduced cost, the former rarely resulting in the latter. 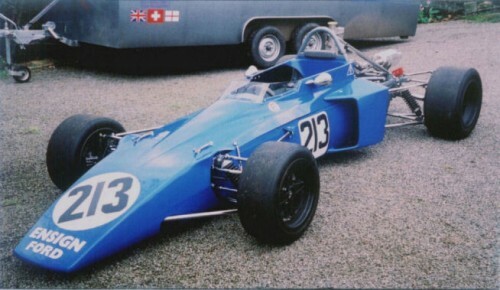 The Ensign chassis represents the period of change between what was then the conventional 'space frame' steel tube chassis and the monocoque 'tub', the latter becoming standard for all single seaters from the early 1970s, early examples in F3 being GRD, Brabham BT38 and Lotus JPS F3. 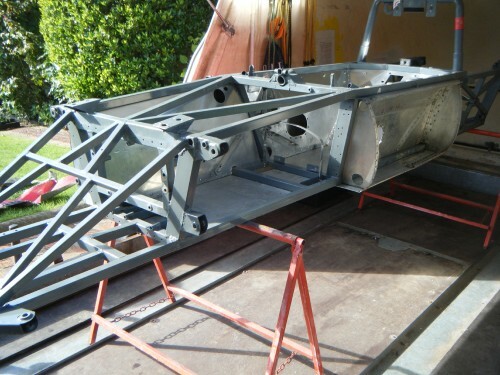 The first 3 bare chassis were built by Mo Nunn at his home in Walsall, chassis manufacture then moving to Arch Motors in Huntingdon and they admit to building the frames, although their specification sheets no longer exist. 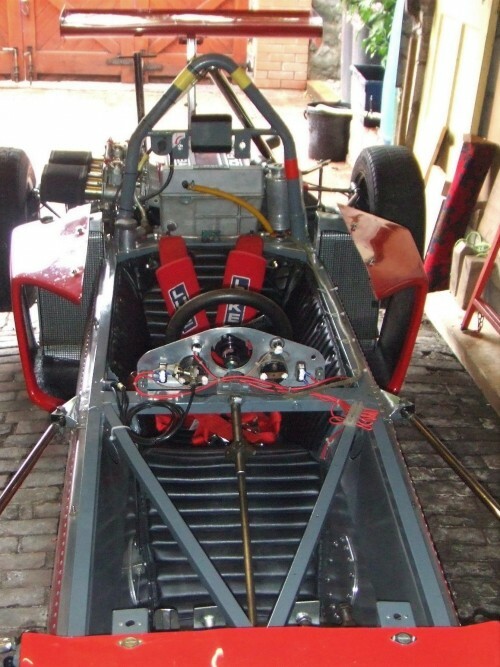 The Ensign chassis was a conventional space frame with a triangulated engine bay and nose, the sides comprising a bottom and top rail joining the front bulkhead to the rear rollover bar bulkhead. On to these rails are closely riveted, in aluminium, a full length floor pan together with inner and outer side panels, providing a void for the 'rubber bag' fuel tanks whilst at the same time providing additional strength to the chassis. The outer panels supported in the middle by two vertical aluminium plates, the top front suspension mounting riveted and bonded at the top. A neat structure although a stressed skin over a space frame is probably almost as complicated to build, or repair, as a pure monocoque. From the front bulkhead the chassis extends well forward, providing space to absorb impact and supporting the composite GRP nose. There's also the front location for the suspension arms and space for a battery or fire extinguisher. 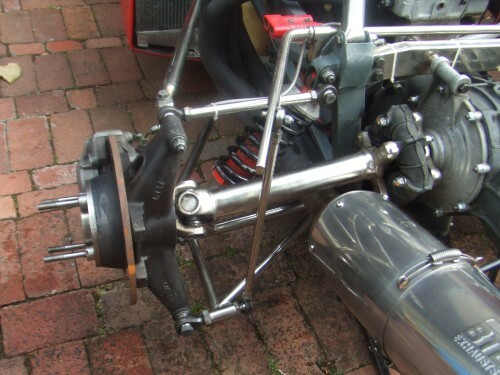 The modified Triumph Herald steering rack from the Lotus 59 is mounted on the front of this bulkhead with vertical adjustment at the outboard ends of the rack and also on the steering arms to control bump steer. There are three hydraulic cylinders on the front of the forward bulkhead for the clutch and split braking system, the adjustable pedals in the driver space with an adjustable foot rest on the left providing support for the clutch foot. 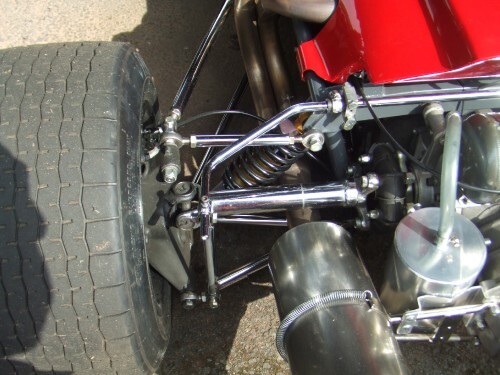 The front magnesium uprights are Lotus 59 with outboard 10.25 inch brake discs and Girling AR3 calipers, the top link triangulated rearwards, the bottom link triangulated forward. 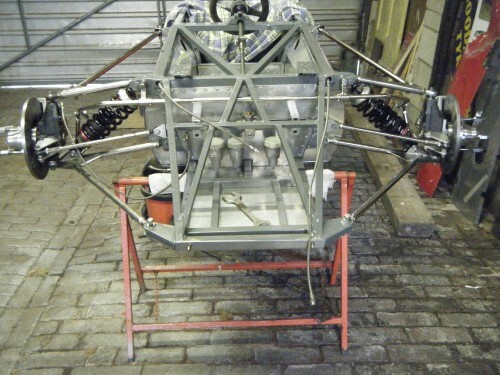 The chassis mounting of the rear link varies and early cars had the chassis bracket riveted above the top chassis rail, subsequently moved to the 'lower' rail as in the image, likely the result of development work by Dave Baldwin to improve stability under braking. There's an adjustable anti-roll bar and steeply angled coil spring/damper units. The spring rate is around 350lbs, 2.25" diameter and 7" long whilst the 8" wide 13 inch magnesium wheels have 4" PCD 4 bolt mounting and 3/8" studs, familiar UK sizes. Probably 10" & 12" wide wheels, front & rear, might have initially been in period, although these days 8s & 10s are satisfactory. The driver area is very civilised for an F3, the semi reclined driving position upholstered with a ribbed 'hammock', located round the top with press studs and extending forward over a raised aluminum cover supporting the drivers knees. This covers the space used for a fire extinguisher or battery. The space frame has closely riveted stressed aluminum panels inside and outside the car, the void between these containing a bag petrol tank either side, each nominally 21 litre capacity. A screw cap filler in front of the instrument panel simultaneously filled both tanks which were interconnected at floor level. The top chassis rails have openings to allow for wiring, control cables and brake pipes to pass through. The usual Lucas instruments are visible with the chronometric tachometer and a leather covered steering wheel and the adjustable length steering column connected to the steering rack with a universal coupling. It's interesting to compare this current Ensign with the car in 1973, unsurprisingly nothing really different although we would all relish those spare fuel injected Holbay 1600s lying around! More of note is the organised set up with a sign written truck on the left and large awning to work beneath, several engineers, here presumably being overseen by Colin Bennett. This is a remarkably professional scene for 1973 and suggests how motor sport was developing commercially at all levels with generous sponsorship budgets. Note the twin 6v batteries in the nose being charged by a petrol generator. Returning to detail the oil tank is located beneath the driver's seat with the filler cap to the o/s, the tank secured by 4 set screws through the floor pan and with a convenient bottom drain plug. In the seating area a small access hatch, secured with two dzus fasteners, exposes the top of the tank for checking the oil level, total capacity 10.5 litres. Either side are water radiators, the Ensign one of the first cars with this innovation. These were originally steel and manufactured by Serck and might have been increased in height at the start of 1972 if the the depth of the covers are compared in period pics. Stone guards were fitted, a commentary on the state of race tracks then. 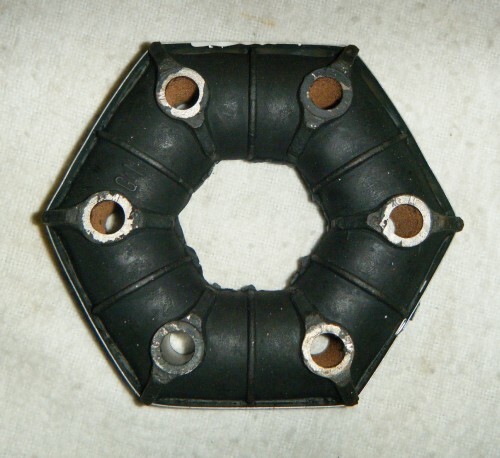 With a single top and two bottom mounts, rubber insulated against vibration, they are interconnected at the bottom by a pipe though the oil tank space, neatly at the top to the usual twin cam connections. Engine cooling is good, enhanced by close fitting GRP covers with rolled leading edges enhancing the airflow. Above all this the substantial rollover bar meets the period requirements, supported by a removable strut to the rear n/s corner although on some 1972 cars the strut was centrally mounted to the chassis and, in period, an oblong oil catch tank sat low between the side members. The front end of the engine cover fits closely over the rollover bar, secured at the front by dzus fasteners, a cut out at the top for the strut. There were variations in period with some engine covers cut away beside the roll over – to improve engine cooling or the cover too narrow to otherwise fit the car? Here's an interesting pic that's come to light courtesy of Keith Lay, although the original source is unknown. The Ensign of Mike Tyrrell, here in a publicity pic at Antigua Airport for Leeward Islands Air Transport (LIAT). 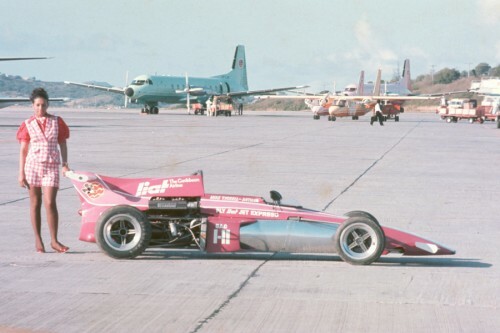 The car was in transit to Guyana for the BOAC race series in 1972 or 1973. Tyrrell was successful racing this car in the Caribbean as well as Europe in period, dying in May 2013. Here the car looks immaculate with the polished aluminium body skin and sitting on original Ensign magnesium wheels, artistic wing fences and the side radiator to the rear of it's 'cover'. The rear suspension follows a well trodden F3 path and at a quick glance might be Brabham BT21A. 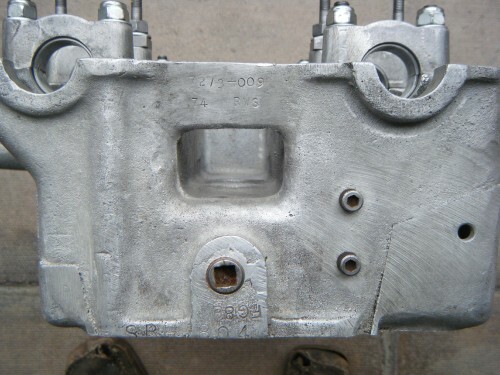 In fact the uprights were bespoke magnesium, cast by Aeroplane & Motor Castings in Tyburn Road and machined by Brineton Engineering in Walsall, LN1970 signifying the date and L127 the casting number, today unobtainable. The rear suspension has a top link and bottom reversed wishbone plus top and bottom radius rods, the usual coil spring damper unit, the springs 325lb, 2.25" diameter and 8" long. An adjustable anti-roll bar is fitted and the outboard 10 inch discs have Girling D14R callipers, outboard universal joints on the large diameter drive shaft, rubber ‘doughnuts’ inboard, the inboard ends of the shafts have screw on balls locating inside the spider to discourage shaft flaying in the event of a total coupling failure. 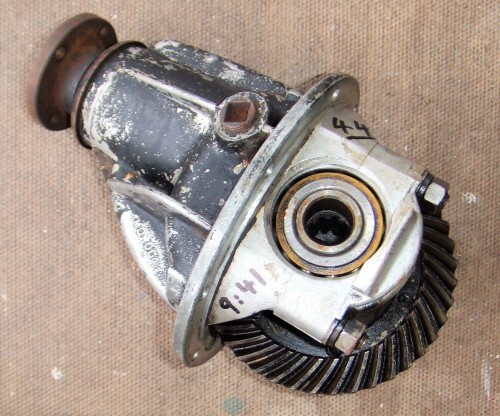 These rotoflex couplings can be replaced by mechanical couplings, a good idea, particularly where the car’s likely to have regular ‘offs’ and ‘kerbs’ although rubber couplings work well, smoothing the delivery of launch power and quickly replaced. The 13" diameter rear wheels are 10" wide, 4 bolt 4" PCD, specially cast magnesium wheels by Aeroplane & Motor Castings and machined by Brinton Engineering, like the rear uprights. Apparently the works 'Iberia' cars of Von Opel and Walker in 1972 had thinner and lighter wheels and inboard rear brakes,. The wheel design is similar to Brabham but not identical. Bodies were moulded in fibreglass or GRP, simply sheets of glass fibre mat laid in a mould and covered with epoxy resin. The resin cures quickly and after removal the finished moulding is ready for trimming, spraying and fitting. For reasonable strength 2 layers of glass mat are preferable although single layer will suffice if weight is critical. 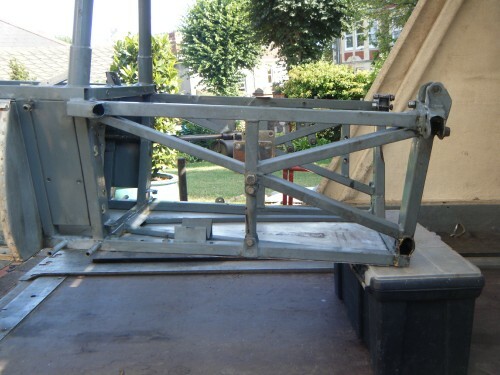 The first bodies were made by Fletcher Boats, New Road, Burntwood, Cannock and then Specialised Mouldings in Huntingdon produced the mouldings, close to Arch Motors who fabricated the chassis. The early cars had just the two radiator covers and a combined cockpit/nose body assembly although the F2 car built for John Burton had front aerofoils and a large, strut mounted, rear wing. In 1972 cars were supplied with an engine cover with a raised rear fin, this supported at the rear on a small gearbox cover. Either GRP or aluminum aerofoils could be fitted at the front and either side of the rear fin although there was a divergence of opinion on their effectiveness, period images showing them used in every combination, or not at all. 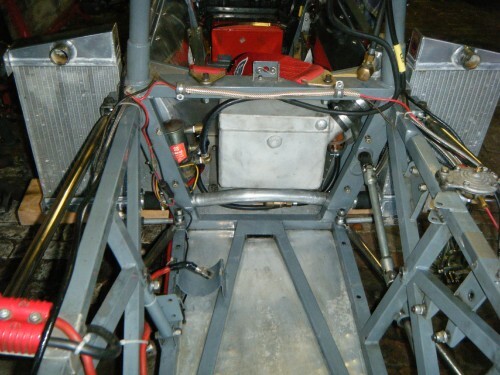 The rear aerofoils were also braced with thin wire to reduce movement. The rear body was discarded in late 1973 and a convenional and wider aerofoil mounted above the gearbox on struts. As time passed owners split the cockpit/nose assembly above the front bulkhead, separate items easier to fit and store. The first F3 Ensign was completed towards the end of 1970 although the project must have been started a year or more previously, Mo Nunn still an active competitor. At that time F3 was using the restricted single carburetor 1000cc engine and the new Ensign was tested late in the year with a 'screamer' installed, Alan Rollinson spending time at Silverstone in December. The plan was to run the car at the Boxing Day Brands Hatch but this did not happen and the car was launched at the 1971 Racing Car show. 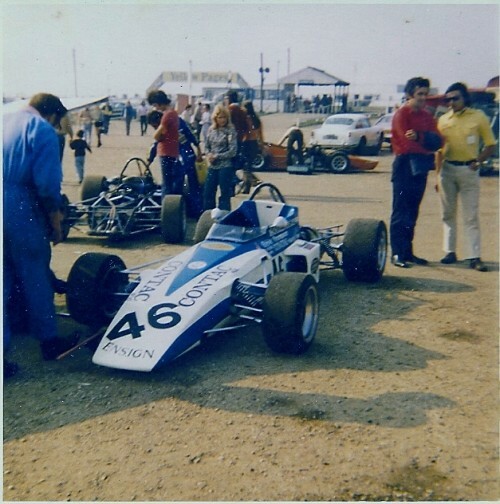 Three Ensigns competed in F3 during 1971, the original chassis from 1970 entered initially as 'Bob Howlings with Team Ensign' and then 'Team Ensign', driven first by Bev Bond followed by Alan Rollinson and Mike Walker. The second car Ensign was entered by Brineton Engineering, driven by SteveThompson. 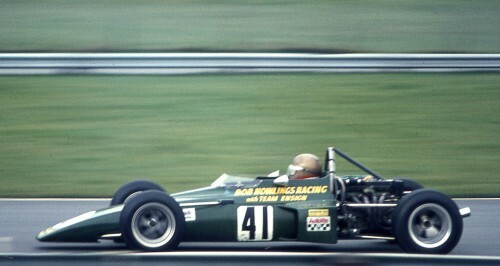 The third was entered by LEC Refridgeration and driven by David Purley, The latter pair were built in 1971. There were no less than three British F3 championships in 1971: BRSCC MCD Lombard North Central with 16 rounds, BRSCC MCD Motorsport Shell Super oil with 17 rounds and BARC Forward Trust with 10 rounds with other trophies to be won. Ensigns competed in these UK events and once at Paul Richard in France whilst Steve Thompson was 4th at Monaco on May 22nd in the supporting F3 race to the Grand Prix, the following day 1st at Montlhery to make a weekend of it. 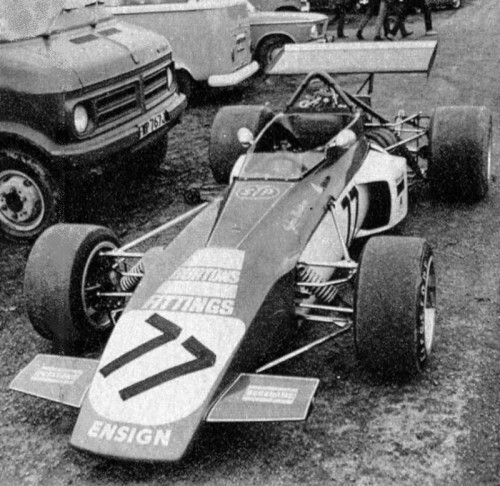 Fitted with the restricted 1600cc Lotus Ford twin cam as demanded by the 1971 F3 regulations the first and second Ensigns were entered for Mallory Park on March 14th. With the start of the revised formula it's not surprising that only 6 cars appeared and 2 of them were Formula Fords! A week later, March 20th at Brand Hatch and teams were starting to wake up with 16 cars on a grid which included the original Ensign LNF1 drive by Bev Bond. Bond was off the pace during wet practice and 13th on the grid but there was time to remedy this as the race was over 40 laps. Bond finished a close 2nd to winner Colin Vandervell (Brabham BT35) and set the fastest lap of 1m 38.0s. A good start for the new Ensign and the car was entered at Snetterton the following week but did not appear. The following Saturday, April 3rd, was a round of the Shell Oil F3 Championship, 36 cars entered but only 15 appeared, mainly Brabham BT35s and five Lotus 69s, Dave Walker (GLTL) and Ian Ashley( Caterham Car Sales) with two brand new Novamotor twin cams. The numbers were completed by one space frame (James Hunt) and two monocoque (Tim Goss & Roger Williamson) March 713s, Bev Bond’s Ensign Holbay completing the grid. There was one practice session on a dry track, Colin Vandervell recording 1m 38.4s but later he hit a patch of oil at Hawthorns carry straight on, the chassis breaking and puncturing a fuel line spreading petrol on the exhaust. He escaped quickly from the fire and was unhurt. The Ensign was next up on 1m 38.6s but after practice panic ensued when the scrutes decreed the car 2cm too wide! The radiator covers were removed in order to conform. Walker (1m 39.0s) had the wrong ratios and a troublesome clutch and Williamson was next in line (1m 40.6s) from Ashley (1m 41.2s). The start had the usual dramas. Walker’s 69 had a dragging clutch and brake heavily to stop creeping, burning out the clutch. This caused the usual chaos but most drivers got safely away. After pulling off the track to retire Walker found a gear whilst coasting into the paddock and quickly joined the fray from the pits, one lap down behind leaders Bond and Williamson. By the 5th lap Hunt had passed Williamson and was closing on Bond, who lost the Ensign on some oil in Hawthorns but was soon back in the fray, 3rd on lap 10 but 7s behind the leaders. Steadily closing on Williamson Bond slipped by at Clearways on lap 17 and the pair then started to hunt down Hunt. By lap 23 the three were close but Hunt spun at Druids 4 laps later due to a sticking throttle. Bond and Williamson then battled for the lead, exchanging places frequently. Williamson led on the final lap but allowed Bond to pass so he could follow through Clearways and then take the inside line to the flag. The plan did not work as in passing two back markers Williamson was balked and could only fume as the Ensign won by 1.8s. The field was spread out with only the first 4 on the same lap. 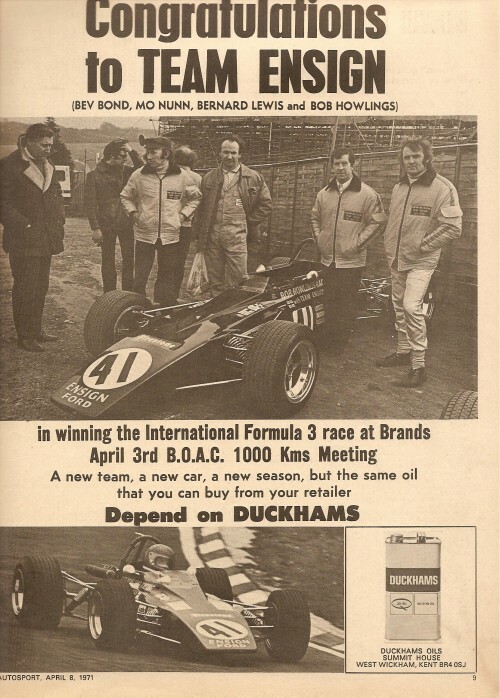 Bond shared the fastest lap with Williamson and Dave Walker and Duckhams Oil commemorated this win with a full page advertisement in Autosport on April 8th. The following week at Mallory Park both Bond and Thompson were entered in their Ensigns although only Bond appeared, winning the first of two qualifying heats and then the 40 lap main event, heading Roger Williamson by 15.2s and securing the fastest lap on 47.8s. Back at Brands Hatch on May 2nd both Ensigns appeared at the same event for the first time, Thompson 5th in the first qualifier and Bond 2nd in the other. Bond was 2nd in the final, 5.4s behind Dave Walker (Lotus 69) with Thompson 7th. May 8th and the relentless pace of the F3 season continued, this time at Silverstone, both Ensigns appearing, although Thompson did not start. No qualifiers this time and the Bob Howlings entered Ensign of Bev Bond swopped places with Dave Walker to take a close win by 0.02s in this 20 lapper. May 16th and the Shell F3 Championship took a trip to Zandvoort, the round consisting of two 20 lappers. Steve Thompson was fastest in practice and on pole for the first heat only to retire with engine problems. Bond did'nt do much better, 2nd to Walker by 0.01s in Heat 1 but sidelined due to an accident in Heat 2, 22nd and 16th respectively in the days standings. It was back to Silverstone on May 31st with both Ensigns appearing, Thompson 2nd in the first 10 lap qualifier and Bond 5th in the second and the fastest practice time. The main event was over 40 laps and this time Thompson held his Ensign aloft taking 2nd place from Dave Walker, Bond retiring on lap 24 with a failed head gasket, placed 17th. The Martini International Trophy meeting was held at Silverstone on June 5th, including a 25 lap F3 race, both cars taking the starting flag with Bond finishing 2nd and Thompson 6th, the first 6 separated by just 1 second - close racing! On the July 3-4th weekend another Shell F3 Championship round was held in France at Paul Richard, both Ensigns featuring in what was a very large entry of 83. As it was 30 cars qualified, Bond finishing 5th with Thompson a lap down in 14th, the Bond car now entered under the name of Team Ensign. The following week the Team Ensign car was competing at Croft and driven by Alan Rollinson who was 4th in the second qualifying heat. The final was over 25 laps and Rollinson finished 4th whilst also setting fatest lap on 1m 10.6s. July 14th and Bond was entered in the Bob Howlings Ensign for the 30 lapper at Magny- Cours but did not appear, the following week not qualifying in the same car at Silverstone. Thompson, on the other hand, qualified 3rd in the second and finished 5th in the 30 lap final, this time only 0.7s covering the first 5. Thompson turnedout at a poorly supported Mallory Park on Jult 25th and was rewarded by wins in both 15 lap rounds together with the fastest lap, heading Roger Williamson's March. Both cars were entered for Thruxton the following week although Bond did not appear. Thompson was 4th at this August 1st event of 15 laps. Ensign entries were now becoing thinner at the main F3 events, Oulton Park on August 28t being Thopmpsons next appearance where he did not finish in the 10 lapper on a showery day. On August 29th a new Ensign appeaed, David Purley with his LEC Refridgeration entered car, 15 laps of Castle Combe where he finished 4th in a small field, one lap down. September 11th and Iberian Airways sponsored the Crystal Palace meeting in South London, two 15 lap qualifying heats with Purley 4th in the first and Thompson 5th in the second. The 20 lap final was a sparse affair with 12 cars taking the start with 6 eliminated in an accident on lap 18. Purley finished 2nd and Thompson 5th, both down one lap from winner Roger Williamson. Thruxton on September 19th for the European F3 Cup team championship, Thompson in team GB1, 40 laps with 19 cars taking the start, Thompson finishing 8th and Purley 23rd, the latter having lost a wheel on lap 28. At the same event there was another F3 race sponsored by Iberian Airlines, this consisting of two 10 lap qualifying heats and a 10 lap final. All the extant Ensigns were entered, Purley (LEC), Thompson (Brinton) with Mike Walker (Team Ensign). Walker and Purley qualified in the first heat and Thompson was 3rd in the other. The final was contested by 24 cars and the Ensigns made a fine sight finishing 3rd, 4th and 5th, Purley, Walker and Thompson less than 2s off the pace and for Purley the fastest lap of 1m 19.8s. The circus headed for Mallory Park on September 26th with the same three entered although Walker did not turn up, Thompson and Purley 4th and 5th in the first 15 lap qualifying heat. The final was over 40 laps and Purley was 5th and Thompson 7th, both one lap down. throttle cable on lap 13 of 20 whilst Walker did not appear.The frantic 1971 season was starting to wind down, amazing the number of events and championship rounds compared with today! The small circuit at Lydden Hill held the Wills ChallengeTrophy meeting on November 20th with two 10 lap heats and a 20 lap final, David Purley 2nd in Heat 2 and winning the final by 5s from Rikki von Opel (Lotus 69), von Opel to move to an Ensign in 1972. Finally it was the Yellow Pages Trophy on December 27th at Brands Hatch. David Purley was 2nd in the first 20 lapper and 1st in the second race. At the end of the season Purley finished 5th in the Lombard North Central Champonship and 6th in the Forward Trust Championship whilst Bev Bond was 3rd in the Shell Super Oils (driving a March 713 after the Ensign). Good results for Ensign's first season although entries seemed erratic and results sometimes inconsistent. Perhaps that was why a more business like approach was planned for the 1972 season together with sponsorship from Iberia Airlines. Concluding the year Simon Taylor penned his regular track test in the last issue of Autosport for 1971, his choice being Burton's F2 Ensign and David Purley's Vegantune engined F3. The first Ensign F3 built in 1970 is intact and was sympathetically rebuilt around 2000 with a 998cc MAE 'screamer', as fitted briefly in 1970, the planned entry for Boxing Day Brands Hatch not fullfilled. Following this rebuild the car had little use, the owner prefering his other Ensign fitted with a 1600cc twin cam. The car changed hands around 2006 and is secure, somewhere in the UK, not being used as I understand the current owner has taken it apart. The second chassis, the ex-Steve Thompson Contac 400 car, has been rebuilt and currently resides north of Hadrians Wall and looking good. The third chassis built for David Purley moved to the USA in 1974 and is still there, less engine, and with the same owner. There are plans for the car to be run once again by the owners son & grandson. I have just read your very good history of the Ensign LNF3. I met Mike Wilds in 1970 and we drove in F4 together. In 1971 the people who lent Mike a Vixen VB1 took it back and he sometimes drove my VB4 in Formula libre races with me doing the championship races. I stopped driving in 1971 but in 1972 my Dad Jack Cavill bought a second hand March 713S and a Vegentune engine for Mike to race in F3. We ran the car from our workshop in Aylesbury, Bucks. We realised that the March was not really competitive and Dad ordered a new Ensign. Ensign were so busy at the time running the works F3 cars and building customer cars that we had to find someone to go to Walsall and build the car. We sent a mechanic Mike Greenwood who I think had worked for Colin Vandervell. He built the car and we continued to run it from Aylesbury. 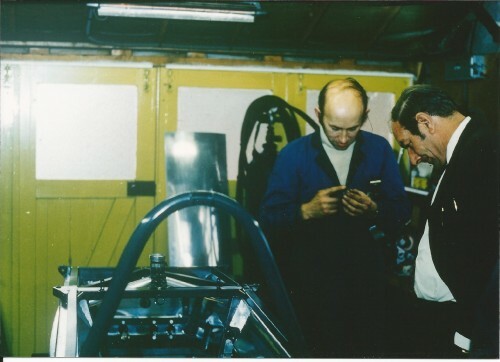 We needed a full time mechanic and Mike knew Colin Bennett who was working for Stan Mathews at the time and persuaded him to come and work on the car. Colin shared my flat for the next two years. Dad bought a new Ford Chassis Cab truck and built the body for it. Mike then found Colin Philips and Sid Pearce of Dempster Developments who came on board as sponsors. In 1973 the Vegentunes were exchanged for Holbay engines. We went to Zanvort for the F3 race prior to the British GP and Tony Brise told us he was exchanging his GRD for a new March 733. Colin Philips ordered one on his return which Colin Bennett built at the Bicester factory and Mike drove it for the first time without any testing in one of the qualifying heats for the F3 support race. The Ensign was then sold to David Franklin who had previously bought my Vixen VB4. David also ended up buying the March 733. I still see Mike, David and Colin Bennett regularly. I enjoyed looking at your motorsports site and your blog. You have some great hill climbers over there. 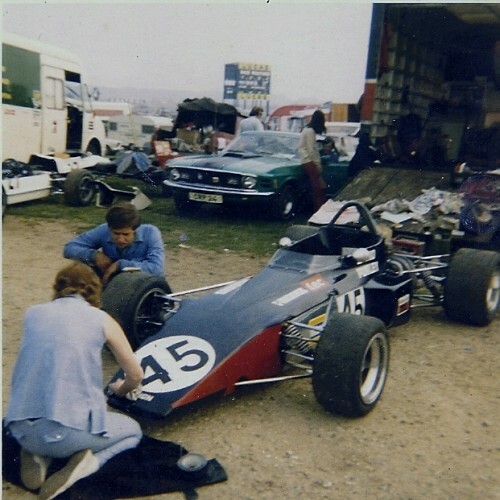 I am emailing because my father, Tom Hilliar, bought an Ensign from Mo Nunn in 1973, moved mom and I to England to live in a van, and raced F3 for the season. I don't think he had great success, but I admire his bravery. I was 2, he had a small foreign car repair shop in a small town, and was woefully underfunded. I think he had bought a Lotus 41c prior to that from Mo Nunn and raced it in FC over here in the SCCA. Unfortunately he died in a car accident in 1974 so I don't know a lot of the details of his racing. I have never sen a picture of his Ensign, but I have found some results sheets on the web from the 73 season. I am curious if you have any other Ensign F3 pictures from 73 that might have him in it. He seems to have run lots of different numbers so I cannot help there, but he was very tall. Thank you for your time, I appreciate reading about your cars and the F3 history you put together. at Arch Motors. I got the address for Mo's home number wrong where the 1st car was built, it was number 19 Holly Lane, not 41 (senior moment). 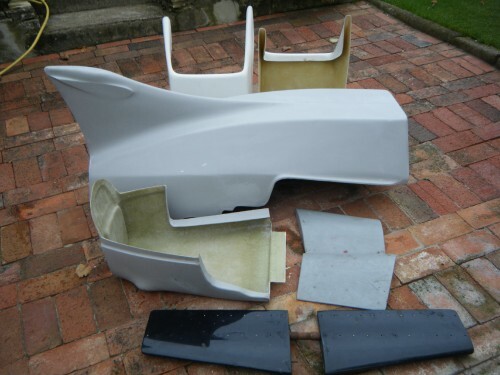 New composite GRP bodywork is available for Ensign F3 cars. Side radiator covers, taller type post 1972, which fit most cars and can be cut down for earlier cars. 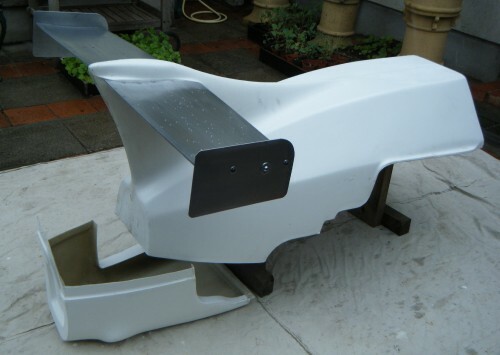 All are supplied with light grey primer finish and will require trimming to fit your car, surface preparation and spraying. Some available from stock and also good used items. There is a delay of 2-3 weeks for new mouldings which are normally 2 layer for strength although single layer can be supplied to reduce weight. Aluminum aerofoils and screen will take longer. Shipping anywhere or collection from Bristol in the UK. Please email to let me know your requirements and prices/availability/shipping details sent by return. New reinforced rubber 'doughnut' couplings, 3 spider mounting as fitted to Ensign F3 cars and others of that period, 4.5" PCD. Available 'off the shelf' at £35.00 each plus carriage. Sturdy items that fail infrequently although probably wise to treat as a 'lifed' item. Used workshop storage boxes. Red 140mm l x 85mm w x 80mm h, fits slotted wall units and also in other colours and sizes. Blue 430mm l x 130mm w x 110mm h. Red or blue £2 each. Used Dome 2 folding gazebo, nominal 3m square, folding steel frame. Complete with wheeled cover and ground nails. £50. 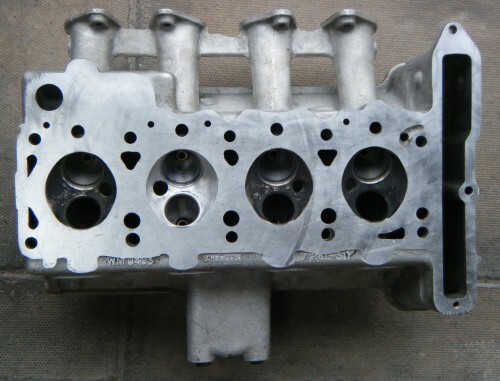 Original Lotus Ford cylinder head, Holbay modified for use in F3. Holbay stampings and identification by Paul Dunnell, of course ex-Holbay. 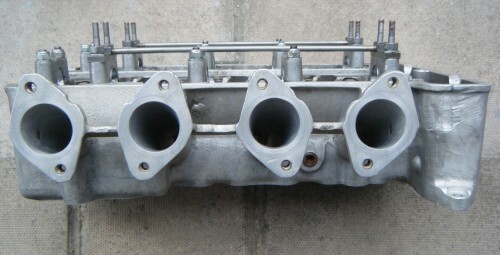 Suitable for any fast twin cam, dynoed over 180bhp on twin Weber 45s. Currently suspended from sale as a new head is being machined to it's Holbay dimensions. However, let me know if you might be interested, £2500. Various manufacturer and championship designs. Printed on self adhesive vinyl and choice of sizes available to order. Amongst those currently available are Duckhams, Firestone, Ford, Holbay, STP, MRC (Barry Bland), Motorcraft.